Without doubt, this innovative Godin is one to challenge the big boys. Innovative. High-Definition Revoicer is a great feature. Reviewed finish isn't to all tastes...but more are available! You wouldn't be far wrong if you thought that, despite all the huge and fast-moving advances in the world of technology, the good ol' electric guitar seems stuck in a time-warp of reissues or designs based squarely on the past. Us guitar players don't want innovation, do we? Well, try telling that to Robert Godin and he'll laugh in your face. Yes, there's plenty of 'retro' within Godin's sizeable instrument collection, such as the funky 5th Avenue electric archtops or the garage- rock Richmond Empire, but these are augmented by dual- or triple-voice electrics with synth access and both magnetic and piezo acoustic outputs, or indeed, Fishman's TriplePlay system. This new Session Custom '59 is case in point: a retro-y looking, Tele-inspired solidbody that adds a Strat vibrato, Gibson-style neck humbucker, and an offset single coil at the bridge. The real clever bit however, is something called a High-Definition Revoicer - a clever switchable circuit that effectively turns passive pickups into active units. If not two guitars in one, you effectively have two sets of pickups onboard. If that's not enough, the five-way lever switch offers the standard dual pickup selections (neck, both and bridge) and adds the single coil of the neck bucker with the bridge unit in series (for a bigger, Danelectro-like sound) or standard parallel. And with a street price well below our quoted sum, which includes a tough gigbag, this is a lot of Canadian- made guitar for the money. "This is a lot of Canadian-made guitar for the money." 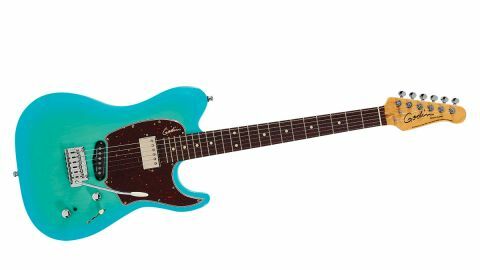 Despite its bells and whistles, the Session Custom '59 is a straightforward platform, with its chamfered-edge solid body from Canadian basswood - very slightly visible through the slightly translucent turquoise-y gloss. And if that's a little garish-looking for some of us, more conventional colours are offered! It tips the scales just over 8lbs - any more girth and it would be a bit too weighty, but there's nothing lumpen about the feel. Neat details abound, like the rounded heel with its matching rounded top neck plate, with four screws that secure the very tight-fitting neck into its body pocket. The neck itself is pretty straightforward, made from slab sawn maple, with a rosewood (or optional maple) fingerboard and 22 medium-but-quite-high frets on a classic Gibson-cambered fingerboard face. With 'clay' dots for a vintage vibe, the edges are nicely rounded for a slightly worn-in feel, and the neck shape is a medium-depth C, slightly V'd in the lower position with a generous girth - nicely mainstream but far from bland or generic in feel. Hardware is equally considered: from the 'high ratio' and very smooth-feeling tuners, through to the dual-post Strat-style vibrato with its metal block saddles and screw-in arm that, thanks to an additional screw, accessed from the back, can be set how you want it. It's these little touches that elevate this guitar from the norm. Then there's the electronics spec, which further moves the Session Custom '59 upwards. Seymour Duncan's '59 is a classic PAF-alike humbucker, and it's paired here with a Godin single coil, with vintage-like waxed covering, screwed directly into the body with a Tele-style stagger in front of the vibrato. Master volume and tone have Tele-style knurled metal knobs, but with position marker dots. In passive mode, there's plenty of guitar here: from the poking Broadcaster-sounding bridge through to that smoother, wider neck voice and the three combined pickup mixes, there's texture, cut, funk or early rock 'n' roll and surf... and we haven't added any dirt as yet. Switching from Fender clean to Marshall grind, it laps it up: with nastier, punkier bridge voices, a brighter Les Paul, almost Deluxe-like mini-humbucking vibe from the neck, especially with some tone roll-off. Engaging the HDR adds a little level boost and more clarity, so arpeggios, especially with modulations and delays, sound superb. It's handy for reduced guitar volumes where, in passive mode, you'd lose the highs a little. If you want to run everything full up, fine, but you'll be missing the nuances that offer huge stylistic versatility, which stops short of detuned metal perhaps - although it'll do a pretty good impression with the HDR engaged - to Gilmour-esque wailing clarity that loves your pedalboard and densely effected soundscapes.